Which way locks? / Which way is locked? Which way is locked? Vertical or horizontal? Which way locks? Clockwise or counter-clockwise? I've seen doorknobs have all sorts of configurations of this, so it never feels natural to lock or unlock someone else's door. The best thing for UX would be to have it be consistent across all locks. Are locks mostly consistent in these configurations or not? The first point to make is that there is no standard in the way which locks turn in order to lock or unlock. So what makes the most sense? Start with the easiest. Turning the key in either direction opens the padlock in each of the locks I tested. Simple! Righty Tighty, Lefty Loosy" - The age old phrase to remember which was to rotate a screw to tighten or loosen it. The rationale being that you are "loosening" the bolt and then rotating to the left (the "left" rotation is in relation to the top) -- aka: counterclockwise. 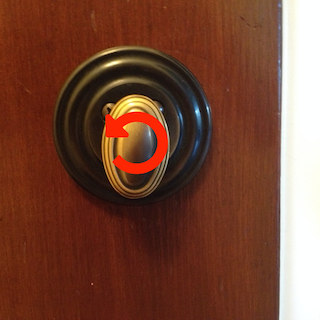 A simple turn hand turn mechanism is on my front door. When it is in a horizontal position, the door is locked. The mechanism can be seen as a representation of the position of the bolt. In this case, highlighted by the red line, the bolt follows the horizontal line made by the mechanism -- indicating it is locked. To unlock the bolt, which way do you turn it? Counterclockwise. Why? Because you're turning the bolt away from the opening. To lock you turn the bolt mechanism towards the door opening. A similar door sits in my basement. In this case a keyhole is on the deadbolt, with a turn lock on the knob itself. 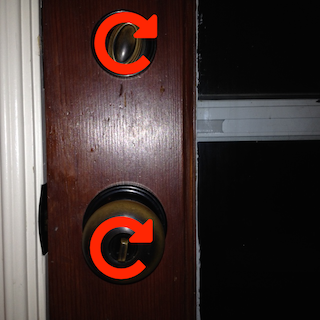 The knob's turn mechanism works in the same way as described above. The position tells me what state the lock is in (horizontal = locked and vertical = unlocked, as described above). Turning the mechanism "away" from the opening will unlock the knob. But what about the keyhole? It always faces straight up. In fact, I can't get the key out of it unless it is straight up so how do I tell what state it is in? Although I can't tell the state, I can follow the same rule of turn "towards" the opening to verify that it is locked. Here we have both a deadbolt and a knob lock. Both in the locked position -- known by their horizontal position. Perhaps a little annoying, but they still fall inline with the mental model of what's happening above. Turning the mechanism away from the door opening will unlock them, and turning the toward the opening will lock them. What I've presented here is my "mental model" of how the lock mechanism works. When I encounter a lock that I've not used before this is the model I use to address the operation of that lock. Others may have a different mental model; perhaps an "always counterclockwise" mental model in which a lock is always turned to the left -- no matter its relation to what is being unlocked. In this case, the user would be very annoyed with my kitchen door. Because there is simply no standard (and you don't have to follow standards, it's just nice when you do) we can't claim there is a correct mental model to have. But, naturally, I would argue that my mental is the more proper one. Most people would tend to argue their mental model is the more proper, too. Turning the mechanism away from the point you are locking means you know which is way is which. An arbitrary direction is always open to interpretation and potential confusion, while an action in relation to the object (the door opening) is a constant reference to base off of. 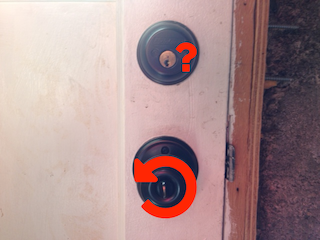 Since writing this answer I've naturally paid a little more attention to how I lock and unlock doors around my house. I've discovered a lock that works totally opposite of the rest. The screen door leading out of kitchen has a lock which turns counterclockwise to unlock and clockwise to lock. If you remember my description of my kitchen door above, you'll remember it is a right opening door and that the locks on it work in the opposite direction. In the case of the screen door turning the lock "away" from the opening locks it, and turning it "towards" the opening locks it. I can't use my mental model of how doors work on this! But I've realized that my "muscle memory" has kicked in and I instinctively remember how this particular door works (i.e., opposite of how I would normally expect it). As a result I don't have an issue with it... but I wouldn't be surprised if I did in the past. A horizontal bar blocks your passageway, hence should mean closed. Based on the same idea that a 'go straight' sign's arrow points upwards, a horizontal bar will block your way. Or possibly it's just a remnant from a simpler design where the angle of the lock directly informs you on the status through it's physical nature. And therefore, just a result of how doors work. The direction of rotation, clockwise / counter clockwise, depends on your location. I've clearly noticed locks in Europe and New Zealand consistently going the other way when locking. First, I would like to say that I install locks for a living. While I do a lot of locksmith work, I do not call myself a locksmith, because I strictly work on locks for buildings. That is, I don't crack safes or open cars. I own a company that specializes in selling and installing residential and commercial door hardware. There are basically two types of locks on doors: cylinder and mortise. Mortise locks are comprised of a rectangular box that fits inside of a, well... a mortise, which a carpenter cuts into a door. Because of their design, the key is inserted into one side, and the latch attaches to the other. They cannot be reversed, and they can only be installed one way. There are four types: left hand, right hand, left hand reverse bevel, and right hand reverse bevel. To understand the types, it is easiest to first understand cylinder locks. While mortise locks are still manufactured and used, they have fallen out of favor over the years. This is mostly because they require a skilled carpenter, or a specialized machine (which no one makes anymore), to install. A cylinder lock, which is what you probably have on your home, can easily be installed with a drill and the proper bits. They essentially just fit into a hole. 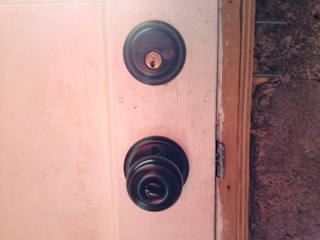 Cylinder locks can be reversed, because they fit into a round hole instead of a rectangular mortise. So, unless you have a curved lever or latch, they are all the same. The only time they are "handed" is if they have an exposed piece, which is meant to be displayed in a certain way. Even then, they only come in left and right hand. 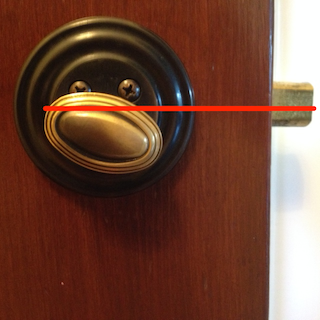 The "bevel" refers to the angle cut on the striker, so that the door closes without you having to turn the knob first. Even if a cylinder lock is handed, you can still rotate the bevel to face the door frame and strike plate when it closes. Thus, there's no reverse bevel. If you're still with me, there are four types of mortise locks, because the key can only be inserted into one side, and the bevel of the striker cannot be rotated. There are four types of doors. The hinges can be on the left or right, and the door can open into or out of a room. With mortise locks, the key was always inserted vertically, and the key was turned towards the frame to lock and away from the frame to unlock. Likewise, the thumb latch on the inside operated the same way. So, it makes sense that a cylinder lock should be installed the same way, since locks have worked this way for at least a century. 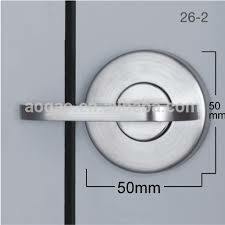 However, there are some nuances to cylinder locks, which prevent this from being a universal rule. 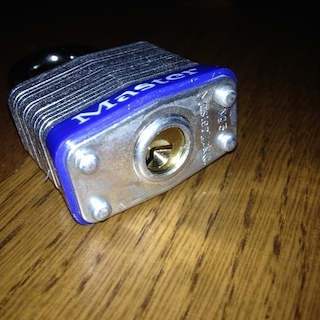 The actual locking mechanism of a cylinder lock has a flat piece of metal that connects the inside and outside of the lock and passes through the latch/bolt, which holds the door closed. This is called the "tailpiece." If the correct key is inserted into the lock, you can turn the tailpiece left or right, 90 degrees, from the outside. The tailpiece can be freely turned by the latch without a key. If you held just the locking mechanism, you would see that the tailpiece has a total of 180 of free rotation. THAT is why this question exists in the first place. You can install almost any cylinder lock in the unlocked position with the thumb latch in the vertical OR horizontal position. So, here's what I do know for certain. Some manufactures design their locks to function one way or the other. From what I understand, this is because there is more tension on the lock when it is turned until it stops. If you think about it, and remember that the tailpiece turns 180 degrees, there is tension on the pins of the lock when it is turned left or right, but none when it is in the middle (the vertical position). I know that this is confusing, but some locks are designed to be under tension in either the locked or unlocked position. It deepens on the manufacturer and model. I will say that, when the direction does matter, it is always noted in the instructions. So, check those first and follow them. Also, to obfuscate things more, some manufacturers make locks where the latch sits at a 45 degree angle. All cylinder locks only have to turn 90 degrees to function. So, these particular locks tilt towards the frame when locked and away when unlocked. But, they never rest in a vertical or horizontal position. Schlage makes many models in this style. Lastly, I have also seen cylinder locks with labels on the faceplates. Some have an arrow or mark for the locked position. Others actually have the words locked and unlocked etched into the plate. To further complicate things, I have seen these labeled faceplates with the locked position vertical, horizontal, and in between. TLDR: All locks are different. Follow the manufacturer's instructions. If the direction is not specified, then install the lock so that it is unlocked when the thumb latch is vertical and locked when it is horizontal. The latch or key locks when turned towards the frame (strike plate) and unlocks when turned away. Whether that is clockwise or counterclockwise depends on whether it is a left or right handed door. I actually own a car that locks/unlocks differently on each side. On the driver's side, you turn clockwise to unlock. On the passenger side, you turn counterclockwise to unlock. It drives me crazy, since it doesn't even follow the idea of turning away from the direction of the door opening to unlock. Until a few years ago I can't remember one toilet doorknob (shaped like a bar) that was in a vertical position when closed. The horizontal position always meant that the door is closed. This seemed to me a convention that had to be followed just to avoid you forget to close the door and when looking at the doorknob you believe that you actually closed it. I leave the possible scenarios following that situation up to your imagination. Recently I noticed that in many places no thought at all is given to this notion and doorknobs with vertical and horizontal closing position are carelessly mixed up even in the very same lavatories. This is definitely a huge gap in UX. There should be an IEEE RFC for that. There are some Schlage mortise locks at my work that vary, some are vertical when unlocked and horizontal when locked, and vice versa. Some of the locks turn away from the frame to lock it, and vice versa. 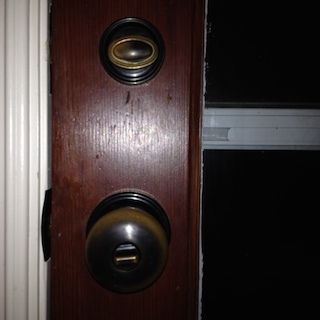 Just installed new locks throughout my home, deadbolts and knobs. I set all the deadbolts to vertical when unlocked and a turn of the latch clockwise now locks them with the latch remaining in a horizontal position, the same direction as the deadbolt itself. This was completely contrary to how I initially installed the old ones without any thought whatsoever. I looked up this question because it's taking some getting used to and I wasn't sure if there was a standard. However, for some unknown reason, I chose, if not by default to have all the door knobs lock in the vertical position turning them clockwise to unlock. This seemed natural presumably from many years of locking doors. Just the reasonable man looking for a reasonable answer. Not the answer you're looking for? Browse other questions tagged consistency or ask your own question. Which is more important, less mouse distance to travel or visual consistency?